New 2019 model here now. rd to reach destinations will be safe and hassle free. GPS is built in and even has WIFI updates. Your entertainment needs are covered with AM/FM and DAB+ Radio. Bluetooth is included for all your call and voice text needs as well as connection for Apple Car Play and Android Auto allowing you to use your phone without it being in your hands. 7 Seats to fit everyone in, or fold flat to get all your gear in and a beefy 3 Tonne towing capacity to get all the toys to and from your favourite spot. Plus all the usual suspects, 6 Airbags, Rear Diff Lock, Advanced Hill Descent Control, Brake Assist, Electronic Assist Steering. This is all on top of Fords Service Price Promise 15000km/1yr Service Schedule, Up to 7 Years of RACQ Roadside Assist, Free Service Loan Car. Located only 5 minutes from Chermside Shopping Centre. If this sounds like the right fit for you come on in for our fantastic Prices, Great Trade Ins and outstanding Service and Competitive Finance Packages. 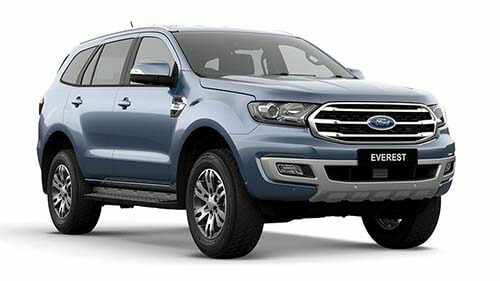 I'm interested in a New 2018 Ford Everest Trend 4WD (stock #SW94).